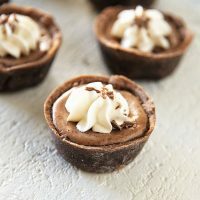 Mini Bailey’s Irish Cream Mocha Cheesecake Tarts: Mini creamy cheesecakes flavored with Bailey’s Irish Cream liqueur, chocolate, and espresso all baked into mini chocolate tarts. A fellow food blogger asked on a forum the other day…is it worth it to go to culinary school? The correct answer is…that depends on why you want to go? His answer is that he wanted to grow his blog and give it more legitimacy. Many of us had to break it the sad truth to him. That most of us who went to culinary school do not have the big profitable blogs. And I’m going to say something that gets me in trouble. Most of the big blogs don’t really know how to cook/bake. The baking especially rarely works out. Which is why most of them are baking with cake mix and making no bake cheesecakes and no churn ice cream. Now, don’t get me wrong…I use cake mix on here from time to time. I make a no bake cheesecakes. And I make no churn ice cream. There is no substitute for the real deal though. I did end up telling him that if he had a passion to learn for himself and not to turn a profit then he should go. While you can learn many things from just watching a You Tube video, culinary school did teach me things my mom could not. One glaring thing I can usually do is look at a baking recipe and know if it’s going to turn out before baking it. It gives me a base knowledge so I don’t always have to follow a recipe to a T to know it will work. I know the science behind a lot of the baking, which is what appeals to me about the baking. The other thing I noticed about the blogs with professional backgrounds…we tend to remake the recipe over and over BEFORE it goes on the blog. My friend Jenni runs Jenni Field Pastry Chef Online. I watch her on my personal FB feed make, remake, and remake her recipes, I don’t know how many times she made butterscotch this week. That’s what I do too. I make, remake, and remake. Because of that I rarely have any comments that a recipe didn’t work out. And when I do it’s usually because someone subbed skim milk for heavy cream or reduced the sugar and are shocked to learn not to do that. The downfall of the professional background blogger is that we tend to like the more “complicated” recipes. We don’t think they are complicated but the average person does. I don’t make cupcakes from scratch if I’m feeding thirty 7 year olds…that doesn’t make sense. Sometimes I buy sandwich bread. Depends on how much times I have. I had thought about making these for years. The recipe is inspired by one of my favorite chefs. However, he does some rather complicated recipes. While this one is not that complicated (in my opinion), I am sure when people see the short crust recipe instead of just cookie crumbs and butter for a crust they will go running. These are fun to make and delicious to eat. I think they are perfect for Valentine’s Day! Using a stand mixer with a paddle attachment, beat together the butter and powdered sugar. Scrape down the sides and bottom of bowl and add egg yolks, one at a time. Scrape down the sides and bottom of the bowl and add the flour and cocoa powder on low speed. Form dough into a round ball. Sprinkle rolling area with flour and roll dough out to a 1/4-inch thickness. Cut 6 round pieces of dough out using a 3 1/4 inch biscuit cutter. Gather the scrapes and re-roll out to get two more rounds. For 8 total. One cup at a time, use your fingers to press the dough into the crust of even thickness lining the bottom and sides of the cup (the dough should reach the rim of the cup). Set aside while you prepare filling. Using a stand mixer with a paddle attachment, beat together the cream cheese and sugar until light and fluffy, about 3 minutes. Add the eggs, one at a time, scraping down the bowl after each addition. Add the espresso powder, melted chocolate, pinch of salt, and Baileys Irish Cream. Beat on medium speed until fully combined. 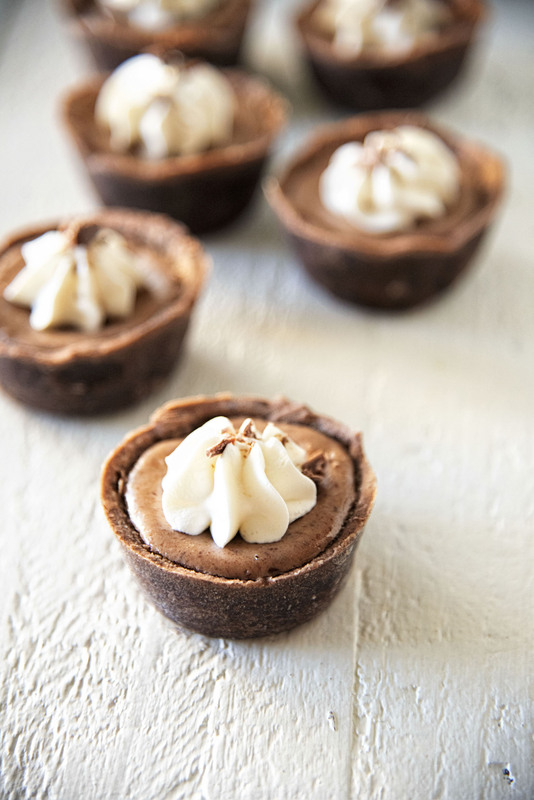 Scoop out 3 TBSP of cheesecake batter into each unbaked prepared cocoa crust. 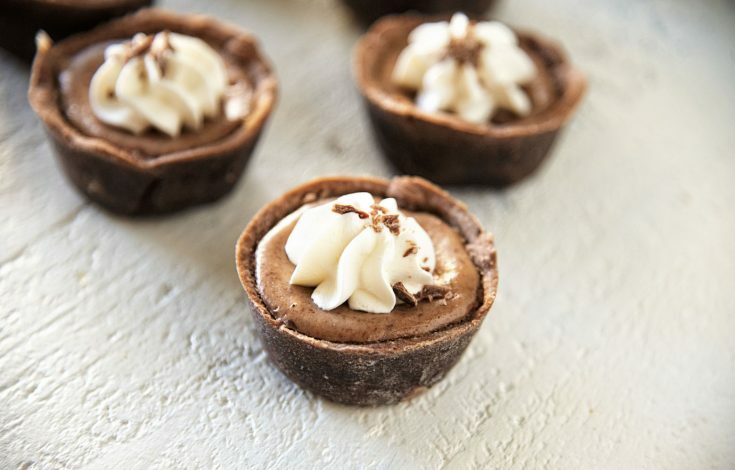 Bake mini cheesecakes for 45 minutes. Using a stand mixer with a whisk attachment beat together the whipped cream and sugar until stiff peaks form. Add the Bailey's Irish Cream. 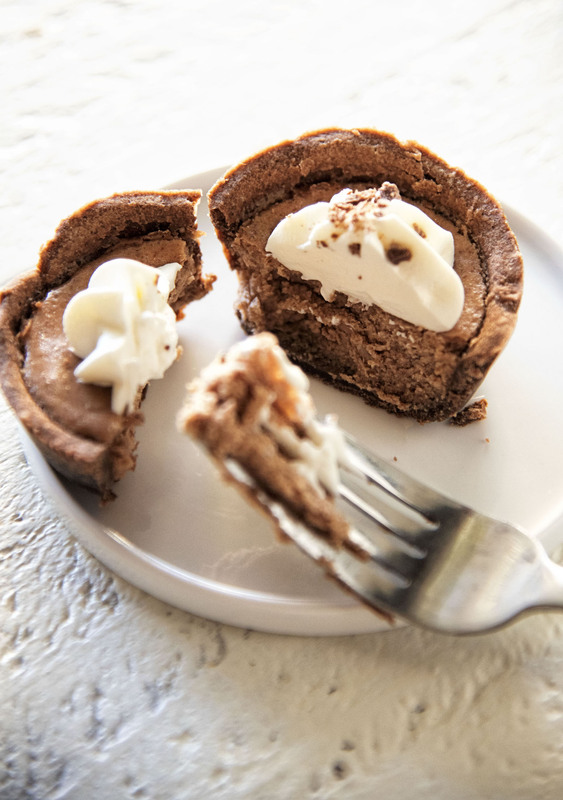 Pipe or spoon onto the cheesecakes. Place in fridge for at least 4 hours in an air tight container.